Each player is a Renaissance Man, skilled as a Scholar, a Merchant, a Knight, and a Baker. The goal is to train, hire, and recruit others, aiming to produce a Master of one of these 4 areas of study. Each round consists of players creating actions by combining a worker in play with a card from hand: Merchants hire new workers. Knights compete to recruit workers from the common pool. Bakers offer their goods in exchange for workers' actions. Scholars train others in the ways of the Renaissance Man. Instead of providing these actions for a player, a worker in play can be assigned to support higher-level workers. Two workers are required for support, and they are laid out as such in a pyramid-fashion. Five workers create a player's foundation, and the first player to complete a pyramid structure of fifteen workers creates a single Master of study, thus winning the game. 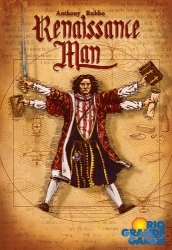 A little luck will help along the way, but the day will surely go to the player who finds the most clever ways out of the trickiest situations in Renaissance Man!